Steven Gerrard’s 17-year affiliation with Liverpool will come to an end at the end of this season with over 600 appearances for the club in all competitions. Los Angeles Galaxy boss Bruce Arena has confirmed that Steven Gerrard, Liverpool legendary midfielder will join LA galaxy at the end of this season. According to various media outlets, all the terms and conditions are discussed and the deal is expected to be completed on Wednesday. Gerrard will follow the footsteps of David Beckham and Robbie Keane as both of them played in the Major Soccer League. The 34-year-old stated that now his footballing future lies in USA. LA Galaxy coach’s Bruce Arena is confident that his players will learn a lot from the experience of Gerrard and he would be a good prospect for his team. Bruce is a fan of Gerrard’s footballing skills. According to him he is a quality player which will fit in his team with perfection. Gerrard made his debut in 1998 and since then has been serving the Merseyside Reds. 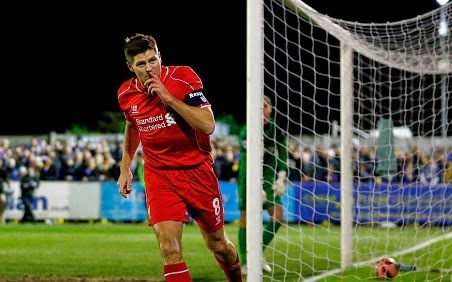 He has scored 116 goals for Liverpool. As reported by Goal.com, Gerrard met the LA Galaxy representatives in London on Tuesday to discuss the terms and conditions of his contract.